Copenhagen is the capital and most populated city of Denmark, with an urban population of 1,263,698 and a metropolitan population of 1,992,114 (as of 1 January 2015). Copenhagen is the coolest city in Scandinavia - edgier than Stockholm and worldlier than Oslo - at least according to style bibles Monocle and Wallpaper magazines, which fawn over its industrial-chic bar, design and fashion scenes, and culinary revolution. This is where you'll find New Nordic pioneer Noma, (once again) voted the world's best restaurant in 2014, and one of 15 Michelin-starred restaurants in town – not bad for a city of 1.2 million. Yet Copenhagen is more than just its design and culinary scenes. It's a royal capital with almost nine centuries under its svelte belt, equally well versed when it comes to world-class museums and storybook streetscapes. Its cobbled, bike-friendly streets are a hyggelig (cosy) concoction of sherbet-hued town houses, craft studios and candlelit cafes. Add to this its compact size, and you have what is possibly Europe's most seamless urban experience. The view from our kitchen in our Airbnb Christianshavn apartment. Swans in a canal in Christianshavn. Move your mouse over the image for a close up of the swans. View along a canal in Christianshavn. Sankt Annæ 8 restaurant in Christianshavn. Allan in front of Christiansborg Palace. Even the Post boxes in Denmark are photogenic. Christmas decorations on Strøget, one of Europe's longest pedestrian streets. 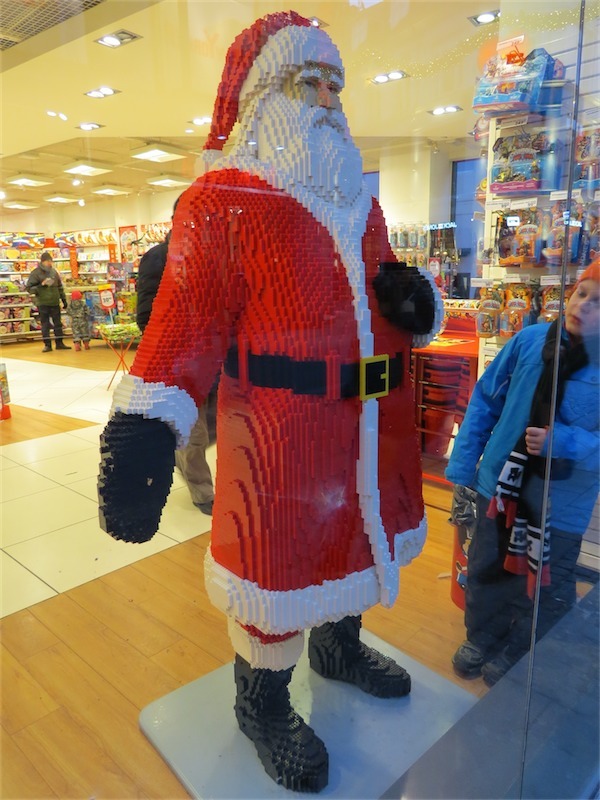 A Lego Santa at the Lego store on Strøget. The Church of Our Saviour in Christianshavn, just down the street from our apartment. Looking along Børsgade towards Christiansborg Palace. Nyhavn a 17th-century waterfront, canal and entertainment district. Move your mouse over the image for a a close up. Move your mouse over the image for a shot of Allan. Nyhavn is one of the most famous and most photographed spots in Copenhagen. Looking towards Amalienborg Palace and Frederik's Church. The Statue of Frederick V at Amalienborg Palace with Frederik's Church in the background. Allan at Amalienborg Palace, the winter home of the Danish royal family. A guard at one of entrances to Amalienborg Palace. An interacitve model of the palace of Amalienborg Palace. It consists of four identical classical palace façades with rococo interiors around an octagonal courtyard; in the centre of the square is a monumental equestrian statue of Amalienborg's founder, King Frederick V.
A room in the Amalienborg Palace. A view from a window of the palace into the courtyard. View into a courtyard off Store Kongensgade. A bicycle sales and repair shop on Store Kongensgade. Having dinner in our very Danish apartment in Christianshavn. The building was almost 300 years old, dating back to 1719. 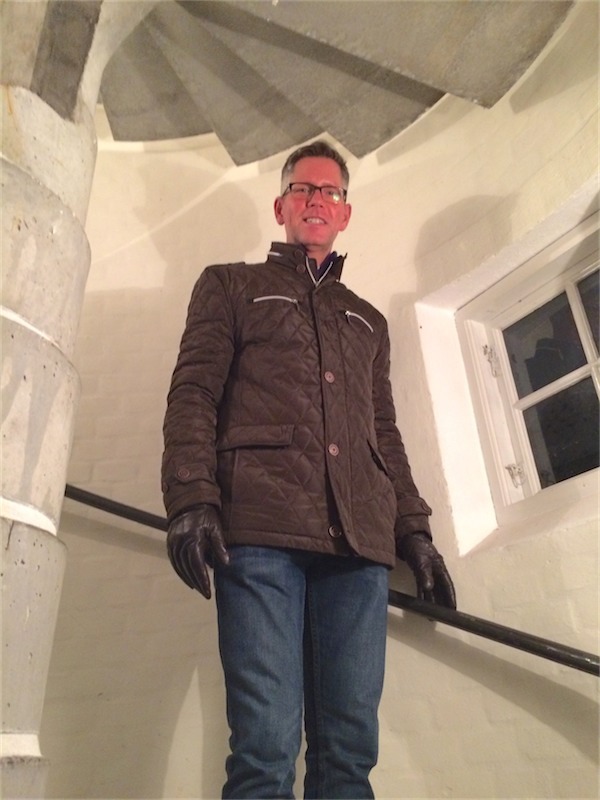 On our way out for the evening, down that narrow circular staircase. Rådhuspladsen (Town Hall Square) at night. 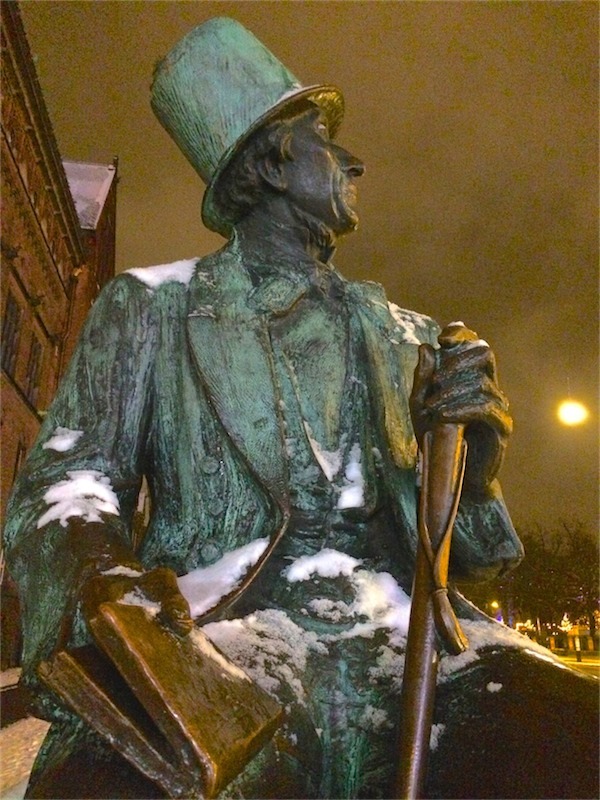 A statue of Hans Christian Andersen, the famous Danish author, best known for his fairy tales. The Magasin du Nord department storeon Kongens Nytorv. Rosenborg Castle, originally built as a country summerhouse in 1606 by Christian IV. It was used by Danish regents as a royal residence until around 1710 and now houses a museum exhibiting the Royal Collections, artifacts spanning a breadth of royal Danish culture, from the late 16th century of Christian IV to the 19th century. The royal cypher of Christian IV, who built Rosenborg Castle. A Danish royal guard sentry box with the royal cypher of Queen Margrethe. The crown of Christian V and the queen's crown. Move your mouse over the image for a photo of the crown of Christian IV. The Throne Chair of Denmark, made from Norwegian narwhal tusks, was constructed between 1662 and 1671. The entrance to Tivoli Gardens, the second oldest amusement park in the world, opened in 1843. During the Holidays, Tivoli Gardens is transformed into one of the best Christmas markets in the world. The Pantomine Theatre in Tivoli Gardens. Ian drinking some gløgg to ward off the damp cold. On December 31 we took a quick day trip to Malmö, Sweden, only 35 minutes by train via the Öresund Bridge from Copenhagen Central Station. Street scene in the old part of Malmö. In addition to the charming older style buildings, there is lots of striking-looking modern architecture in Malmö. So, it's back to Copenhagen for New Years Eve. 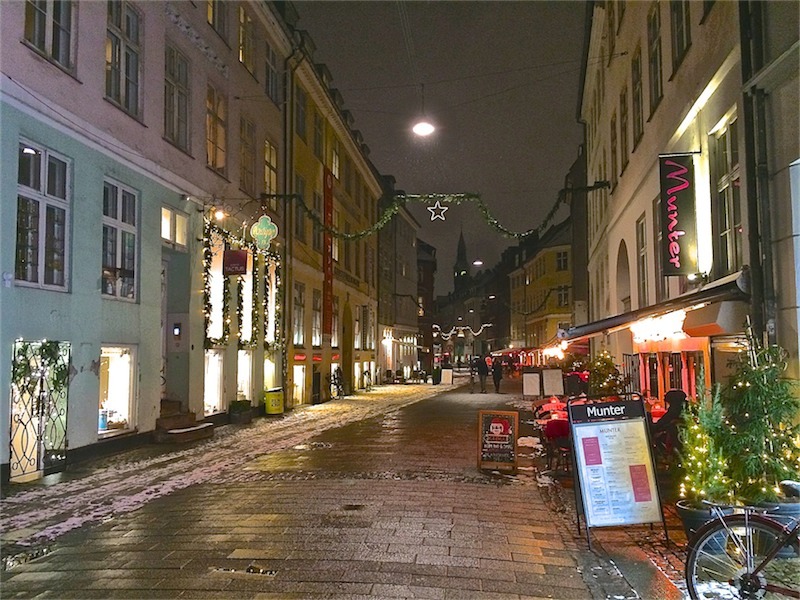 New Year's Eve dinner at Restaurant Hereford Steak on Store Kongensgade. 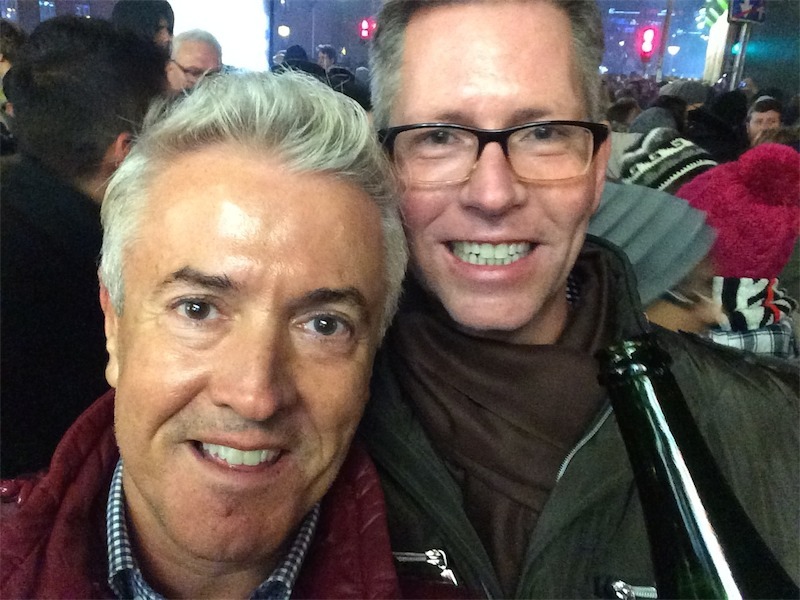 Ringing in 2015 with some bubbly in Rådhuspladsen. Fireworks at Rådhuspladsen (City Hall Square). Pretty much everything is closed in Copenhagen on January 1. That makes it a perfect day to make the trek to see the Little Mermaid. Statue of Frederick V at the centre of the Amalienborg Palace Square. The red carpet is rolled out for the guests arriving for the Queen's New Year's Levee. The Master of Ceremonies awaiting the arrival of the guests. The Queen's second son, Prince Joachim and his wife Princess Marie. Crown Prince Frederick and Crown Princess Mary. This is going to be a nice comfy flight home.